What more can BTS ask for given the consecutive achievements of their latest track “Boy With Luv”? They would definitely appreciate receiving more and more love and support from ARMY worldwide as their recent blockbuster hit scored a perfect all-kill! With reference to the global K-Pop language, a ‘certified all-kill’ means when a song has reached No.1 on all charts except the iChart Weekly Chart. A ‘perfect all-kill’ meanwhile means when a song ranked No.1 on all major real-time and daily charts including instiz’s realtime iChart and Weekly iChart. 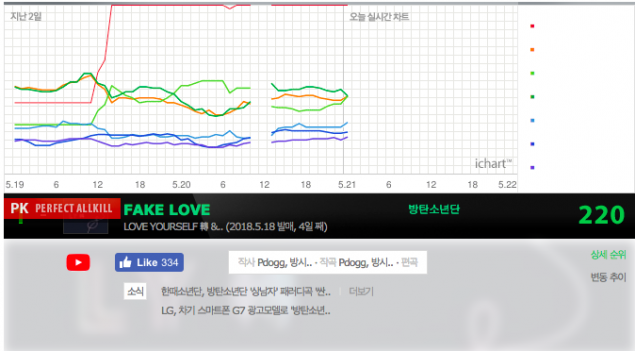 According to All K-Pop, as of 7:30 AM KST, BTS’ “Boy With Luv” has hit a perfect all-kill. And by the way, this is already the group’s second perfect all-kill. Their first was with “Fake Love”. Way to go BTS and ARMY will definitely keep on loving you guys!